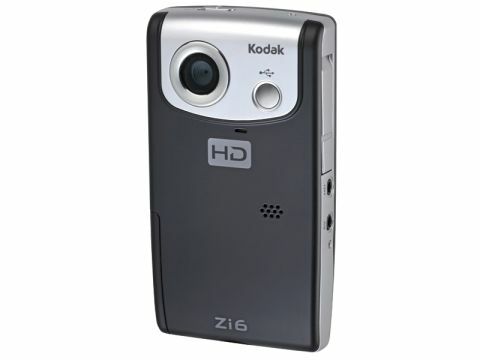 Another high-definition 1,280 x 720 camera, the Kodak Zi6 boasts a similar pop-out USB connector to those featured on the Flip devices. It comes supplied with two pre-charged AA batteries and a mini-charger to recharge them when flat, which is ideal for a device designed to be carried around all over the place. The Zi6's picture quality is the best of this type of video recorder, though a little more intensity in the colour department would've been good. It even offers a macro mode for filming close to your subject. Audio quality is uncommonly high too, with a decent degree of volume, though our only complaint is that it does pick up a little too much background noise at times. The Zi6 has only 128MB of internal memory, but you can expand this with an SD or SDHC card. There isn't one in the box, but they're phenomenally cheap these days, so this shouldn't pose too much of a problem.